After the premiere of Stranger Things, its extremely minor character Barb became a phenomenon, ultimately leading to many Barb doppelgängers featuring in the opening sketch for the Golden Globe Awards at the start of 2017. 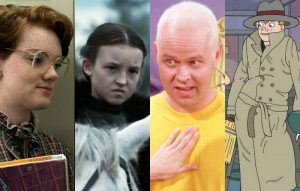 It’s a level of fame that only a few TV characters can aspire to – these 15 other minor parts were lucky enough to have the same to happen to them. The post The Barb Effect: 16 minor TV characters that became cult figures appeared first on NME.